Should Childless Couples Bother With Estate Planning? One reason some people don’t bother to update their estate planning is because they don’t have children. 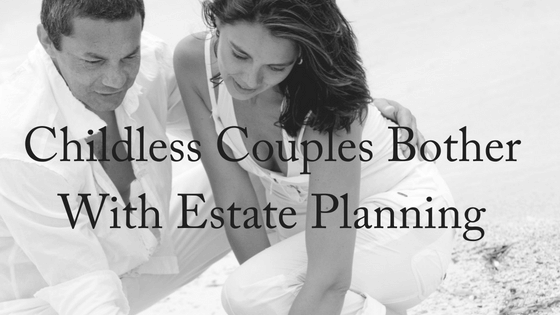 With no immediate heirs, why bother with estate planning, ask childless couples and singles? But complications arise for people with are single without children, and de facto and married couples without kids. While the surviving spouse usually inherits all the married couple’s assets, without each person having an estate plan things can go awry. One scenario could be that the husband dies first, and the assets go to his wife. But when she dies, because she’s always hated his family, everything goes to her side of the family. His side of the family gets nothing, and that may not be what he wanted or intended. This kind of complication and unintended consequences make it especially important for singles and married couples without children to plan not only for distribution of their assets, but how to take care of themselves should they become incapacitated. Perhaps it’s true that people with children assume their kids will take take care of them in their old age – though this is not always the case. But people without children should make arrangements in the event that they lose the capacity to make their own decisions. Every estate plan needs to have at least a will and powers of attorney for financial decisions and an advance health directive. The powers of attorney and advance health directive come into play if a person is unable to make decisions for himself or herself. 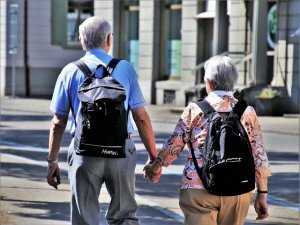 Often for married couples, the person’s spouse is the default power of attorney, but what happens if your spouse becomes incapacitated or dies before you? You’ll need a back up power of attorney whom you trust. If you don’t have someone who is named, the default may fall to a sibling, niece or nephew that you may not be physically or emotionally close to. This person can make decisions which may be contrary to what you would want. You need to think critically about who you would want to be a power of attorney to handle your financial decisions for you. Above all, they must be trustworthy, competent and caring. This person can be older or younger, live nearby or far away and doesn’t have to be a relative. It may be tempting at this point to download a free or cheap estate planning kit (which usually includes a will and a power of attorney) from the Internet to get this stuff out of the way. But the truth is that DIY estate planning kits often create issues when you become incapacitated or die. This is because there are often mistakes in them (rendering them invalid), they’re not clear or they’re not flexible enough to take into account your unique circumstances. One very common mistake when writing your own estate planning documents is that they are not signed correctly. There are very strict requirements for the signing and witnessing of Wills, and if your Will is not signed correctly or is not witnessed properly it may be invalid. Plan for longevity. The biggest concern that childless couples face is outliving each other or both becoming incapacitated. Make sure you have created estate planning that takes into consideration the loss of your spouse, the incapacitation of one or both of you, as well as caretaking arrangements such as whether you want to stay in your own home or go into a nursing home. You’ll want to make these decisions before you lose capacity – or someone will make them for you. Who receives your assets? When choosing who to leave your assets to after you pass, the most popular options include family and/or charity. Moving one generation down and leaving assets to nieces and nephews, or someone you have a connection to is the most common choice. Additionally, leaving assets to a charity or organization that has special significance to you is another option. You’ll want to make sure that assets go where you direct them to – rather than letting the state decide where it goes. What about remarriage? If you lose your spouse, you may find yourself re-marrying (even in old age!). That spouse may come with their own children and extended family. Make sure that your estate planning is updated to reflect this change as getting married revokes all your previous wills. For experienced advice about your estate planning needs, contact us today. We offer a free, 10-minute phone consultation.